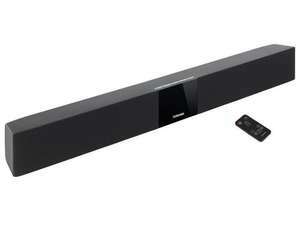 Plug any TV into the Toshiba 3D Sound Bar SBK1 with integrated subwoofer to enjoy breathtaking sound. Thanks to Sonic Emotion Absolute 3D sound technology, everyone can enjoy music, movies and games with room-filling sound. Unlike conventional surround sound systems, it sets up easily and it delivers an immersive listening experience - simply plug and play. There are 3 sound modes for movies, games or music to provide the perfect audio experience.